Note: In photography a “long shot” typically shows an object in such a way as to place it in some relation to its surroundings. I don’t know why, but some days I just look around at things from a different perspective. Today I was given such an opportunity. I am so familiar with every little thing in the cottage. This is because every item has a little story in my mind of how I came to find these cool little treasures. Then I look at the way I may have grouped items by shape, or color, or texture. Perhaps I glance from one side of the room to the other and observe a vignette that I staged last month and I am reminded of what triggered that design at that particular moment. I admit, there are times I take the coziness of the cottage for granted because I am so very familiar with every element of it. But my husband Charles is different. He walks into the room and he sees what has changed and he wonders what makes me tick. He wonders why would anyone in their right mind to think to pair this item with that one? Yet he admits it works. Charles sees the world through a different lens than I do. He considers me a sculptor. Though I am amused by his label, I can see why he thinks that. He sees my repurposing of things, and my pairing of various items, as building a three dimensional collection: a sculpture. I do not perceive myself as such, but I can see how he could come to such an analogy. Charles on the other hand, sees things through shadows and light. I see a collection of old clay jugs. He sees the afternoon sun, from the South, painting parallel shadows across a row of old gray cylinders. This old house can be very dark, but when the sun crosses behind the house, across the pond, the southern rooms glow. 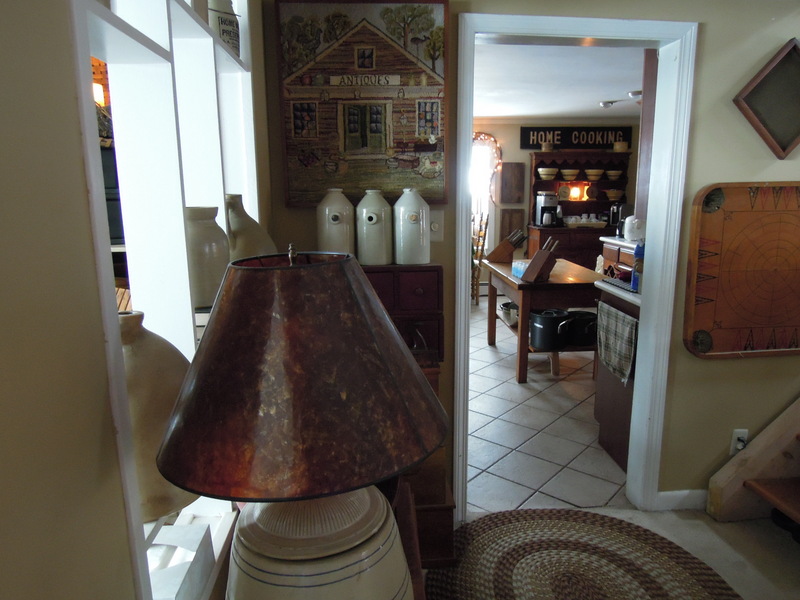 Sometimes you can capture that light trickling into the northern rooms as we see in this photo. So I chose this one, “eenie meenie miney mo”-style. I chose it because I looked at this photo and wondered how he could be so enamored with shadows and light. Charles wonders how I can look at stuff and see what he doesn’t see. I seldom pay attention to lighting, I am typically oblivious to it as I pass it day after day. But when I see one of Charles’ photos, I am reminded of how important shadows and light are in creating the mood I was seeking in my designs.